Splintering wood - what to do differently? I have some cedar I recovered when we changed the siding on our house. 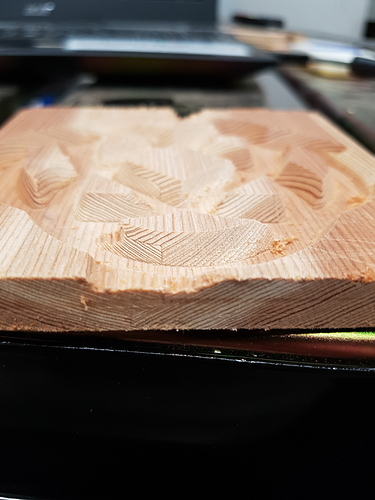 I want to use it for projects, so I made a panel and tried cutting some coasters on the cnc. I got a lot of chipping during the cutout process… It was all ok during the v-carve clearing with the 0.125 endmill and 60 degree v bit, but the 0.25 endmill chewed it up. Managed to save one out of 6 coasters. Anybody have any tips for preventing that? Smaller endmill or smaller depth of pass? Or pretreatment of the cedar in some way? I would either try using a 1/4" downcut bit, or 1/8" downcut bit or a straight flute bit for that kind of work in that soft wood. They are not for punching holes though, there is nowhere for the chips to go but down into the hole. I use the 0.125in downcut bits for soft woods and an 0.063in straight cut bit for cutting the birch hobby plywood. Both leave a clean ( at least not splintered) edge if you have a good waste board supporting the cut. I’m going to give the C3D 1/8 cutter a try with a very low depth per pass. See if I can’t get 5 more usable coasters. This cedar is very hard to work with! Cedar it pretty splintery…also try reducing your feed rate, increasing the RPM.